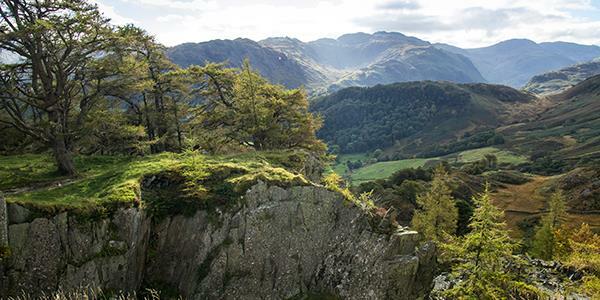 The Lake District is full of hidden nooks and crannies waiting to be explored. This iconic National Park in northern England is admired for its beauty and incredible scenery. Formed over the course of millions of years by slow glacial processes, the Lake District is home to a dramatic series of peaks and fells, lakes and tarns that have been carved out of the landscape. This makes it a stunning place to explore by foot. Perhaps you've visited all of the obvious places and you're looking for something a little different next? Well the Lake District is full of them so you're in luck! Image: Stephen Darlington, licensed for reuse under Creative Commons. Established as a tourist attraction in the late 1800s, the Bowder Stone is a huge rock that still attracts visitors from far and wide. Why? Because it is such an interesting sight. This massive boulder is precariously balanced on one edge and looks suspiciously as though it may topple over at any moment. This is, of course, not the case and back in 1798 Joseph Pocklington decided instead to built a ladder leading up to its summit so that visitors could climb to the top. A staircase has been in place there ever since. 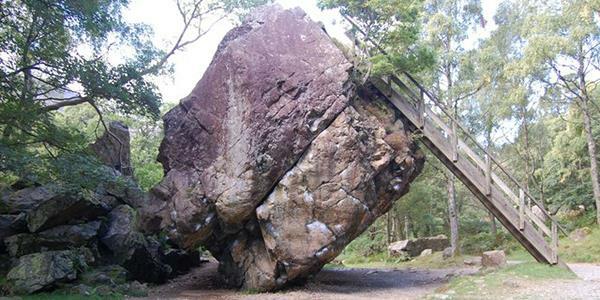 The rock is of volcanic composition and estimated to weigh about 2000 tons! It's thought to have been here for more than 10,000 years. Though it has always drawn attention, it wasn't until Pocklington took the first measures to make it into a tourist attraction that it became so popular. He bought the surrounding land, fenced areas off and built additional attractions on the site in order to encourage more people. In the 1960s the National Trust bought the site and it has been in their care ever since. The little cottage and chapel that Pocklinton had built as additional attractions were restored as bothies for climbers visiting the area. A car park was also put in place a 15 minute walk from the boulder, and the site is equidistant from the towns of Grange and Rosthwaite, both about a mile away, where you'll find cafés and facilities. To find the Bowder Stone car park, use the post code CA12 5XA in your SatNav. Follow the special pathway to the stone. The surrounding Borrowdale valley is exceptional for walks, so if you want to incorporate your trip to the Bowder Stone into a longer route, you'll have plenty to choose from. You could attempt the ascent up King's How. Alternatively there are more walking routes in Borrowdale, along with more information about things to see and do on the National Trust website. So how did the Bowder Stone get here? Unfortunately, there is no concrete answer to this question. It has been argued that the explanation may lie in the glacial movements that helped form this area of the country. Perhaps the huge rock was transported and deposited by melting glaciers? Others argue the more likely explanation is that this is just one fragment from a rockfall that took place. 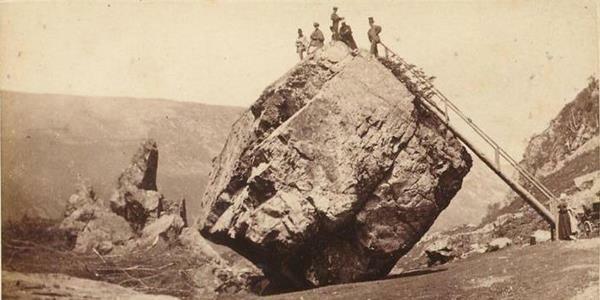 In this case the Bowder stone was dislodged from 200m above on Bowder Crag and came crashing down the cliff to land with immense force at the bottom, where it still sits today. This would explain the perilous position! Either way it is certainly worth a look while you're walking in the area! And... Why is it called that? The name is unusual and again, we're not 100% sure of its origin. Either it's a carry-over from a dialectical form of 'boulder'. Or it is a derivation of the name of Norse god Baldr, son of Odin. (Early descriptions and even early photographs seem to depict a face in the stone). In the 16th century German miners were bought across to help with copper mining in the Lake District. A number of them settled in nearby Keswick and 'Baldr' may have come with them. Many of the valleys and Lakes in the National Park have Nordic names or origins. The Norse arrived in Cumbria in the 10th century, so it's even possible that 'Baldr' predates the modern era! Find out how to stay in the Lake District for yourself and visit all of these weird and wonderful places. Simply pop your details in at the bottom of the page and receive a free brochure.